Detroit's Emergency Manager: 'There's Just No Money' : The Two-Way Kevyn Orr tells All Things Considered the crisis was the city's own making, but it doesn't help anyone to look for blame in the past. 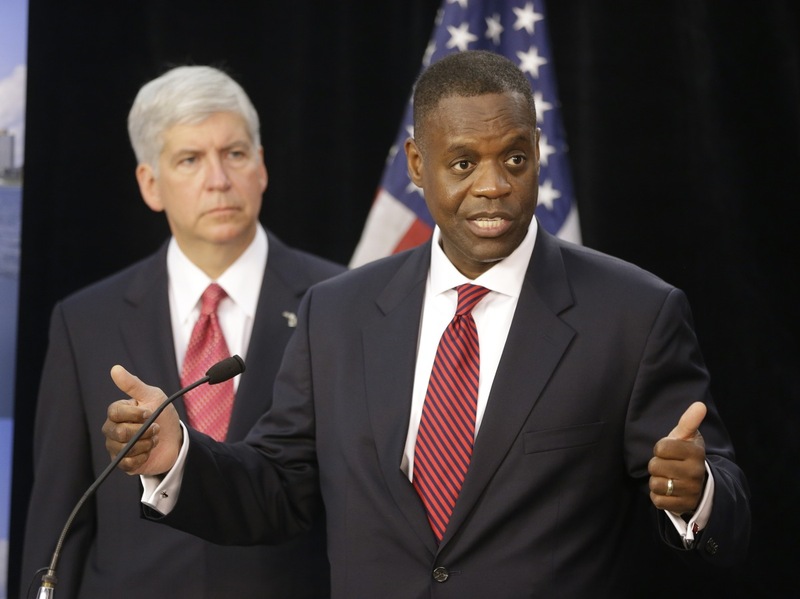 State-appointed emergency manager Kevyn Orr (right) and Michigan Gov. Rick Snyder, at a Friday news conference in Detroit. Detroit's emergency manager, Kevyn Orr, defended his decision to take the city into bankruptcy. The most contentious issue regarding the city is what bankruptcy protection could mean for the pensions of some retired city workers. In a blunt interview with All Things Considered's Robert Siegel, Orr said that saying retirees will receive no money is false. "We're just talking about adjusting them to today's realities," said Orr. Robert pressed him on a number: Will it mean that former city workers will receive 50 percent, 75 percent of what they thought they would get? Orr refused to give a number. Robert also asked him about complaints that the city is reneging on contracts it had made with its workers, who are not to blame for the financial mess the city is in. "Workers are caught with that reality, but also they voted for the leadership of some of their pensions," said Orr. Essentially, he said, "the birds have come home to roost." Robert followed up: "So you're saying the residents of Detroit should be held accountable for the people they elected all those is years?" Orr replied: "No I don't want to be quite that harsh in my assumption. I'm just saying there were many indicators and warning signs that could have been corrected over a number of years and I don't want to blame the victim, Robert. "But I want to say, it doesn't matter what happened in the past. A retrospective, looking behind us isn't productive, what matters is where we are now." And that means the city is drowning in financial obligations. "There is no money," Orr said. "It doesn't matter what I say, it doesn't matter what we look back on, there's just no money." Much more of Robert's interview with Orr will air on today's All Things Considered. We'll post the as-aired version of the interview later today.